An unforgettable party starts with the perfect venue. Whether you are planning a bridal shower, team building, client appreciation, birthday party, anniversary, fundraiser, or a girls night out we have the place for you. 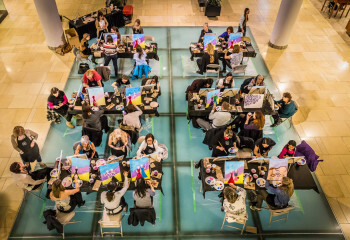 Vin Gogh is a paint and wine studio offering something exciting, creative, and fun for your next private event. We have flexible options for private events that work well within a variety of budgets. Evenings require a minimum $1000 to secure the studio for a private event. This can be a combination of painting, food, and wine. Check out our calendar for a night that works for you. The painting is your choice and we have fun seasonal options to choose from. Start the party with great food and music. Daytime is the right time to save! Same great food and experience but for a minimum of $350. Our studio is the perfect venue for birthday parties, bridal, or baby showers. As always, this low minimum price can be a combination of painting, food, and wine. You choose the date and we take care of the rest. Your guests will be happy and so will you. 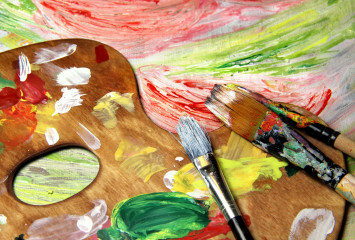 The studio can accommodate up to 46 painters. See what people are saying about choosing Vin Gogh Paint & Sip.